Who would have thought, 10 years ago, that the brave MEX spacecraft would be still alive today? 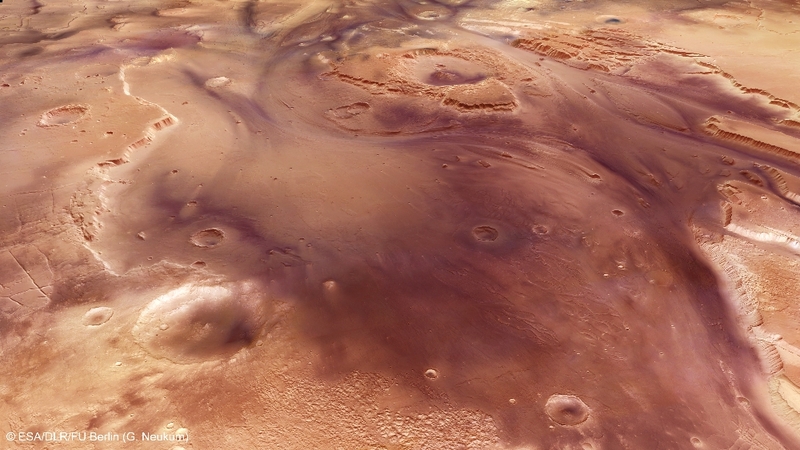 For 10 years, the High Resolution Stereo Camera (HRSC) onboard Mars Express provides astonishing images of the surface of Mars in colour and in 3D. From the beginning on, the breathtaking colour images from Mars delighted both the public and the scientists. For Scientists, the Digital Elevation Models (DEMs) derived from the stereo images provided a major step forward in the precise analysis of the Martian surface. 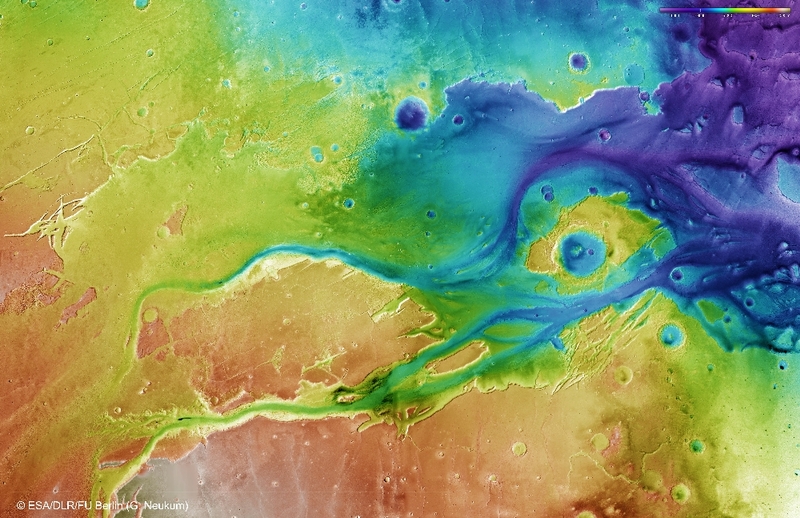 Dramatic flood events carved this impressive channel system on Mars covering 1.55 million square kilometres, shown here in a stunning new mosaic from ESA’s Mars Express. 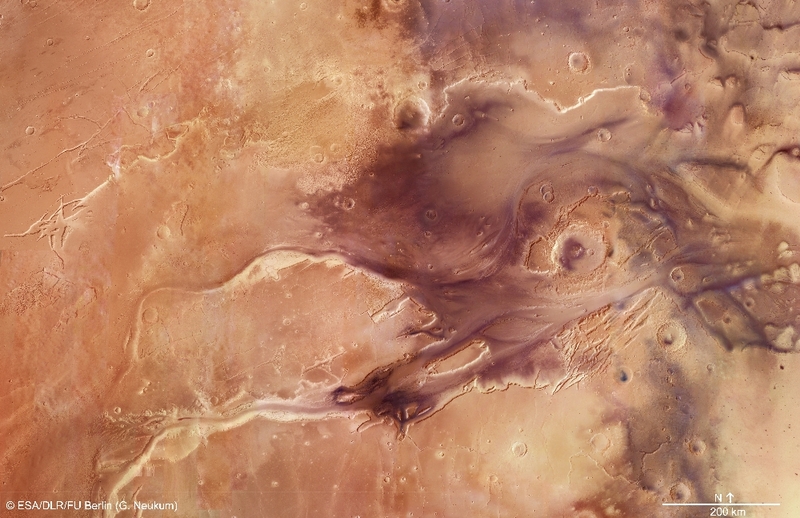 The mosaic, which features the spectacular Kasei Valles, comprises 67 images taken with the spacecraft’s High Resolution Stereo Camera and released during the week of the 10th anniversary of Mars Express launching to the Red Planet. Kasei Valles is one of the largest outflow channel systems on Mars; from source to sink it extends some 3000 km and descends by 3 km in altitude. The scene included in the mosaic spans 987 km in the north-south direction, from 19º to 36°N, and 1550 km in the east-west direction (280-310°E). Kasei Valles splits into two main branches that hug a broad island of fractured terrain – Sacra Mensa – rising 2 km above the channels that swerve around it. While weaker materials succumbed to the erosive power of the fast-flowing water, this hardier outcrop has stood the test of time. Slightly further downstream, the flood waters did their best to erase from existence the 100 km-wide Sharonov crater, its walls crumpled to the south. Around Sharonov many small streamlined islands form teardrop shapes rising from the riverbed as water swept around these natural obstacles. The region between Sacra Mensa and Sharonov is seen in close-up detail in the perspective (picture 1)view above, which looks in the direction of flowing water from the northern flank of Kasai Valles. Zooming into the valley floor reveals small craters with bright dust ‘tails’ seemingly flowing in the opposite direction to the movement of water. Instead, these craters formed after the catastrophic flooding, their delicate tails created by winds blowing in a westwards direction ‘up’ valley. Their raised crater rims influence wind flow over the crater such that the dust immediately ‘behind’ the crater remains undisturbed in comparison to the surrounding, exposed, plains. 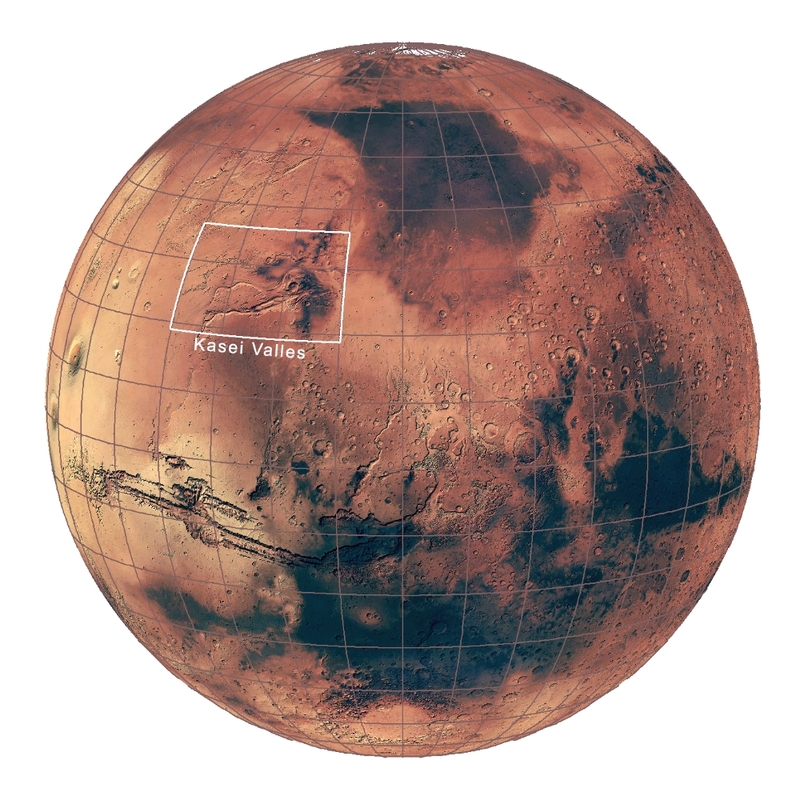 Kasei Valles has likely seen floods of many different sizes, brought about by the changing tectonic and volcanic activity in the nearby Tharsis region over 3 billion years ago. Under the strain of these forces the landscape was pulled apart, groundwater bursting from its ripped seams creating not only violent floods, but also the unique fracture patterns seen at Sacra Mensa and Sacra Fossae. Snow and ice melted by volcanic eruptions also likely contributed to torrential, muddy outpourings, while glacial activity may have further shaped the channel system. Now silent, one can only imagine from examples on Earth the roar of gushing water that once cascaded through Kasei Valles, undermining cliff faces and engulfing craters, eventually flooding onto the plains of Chryse Planitia.